Operators of platforms for Instant Payments via EBICS with EBA CLEARING are aware of the strict requirements on function and performance of their systems. Setting up a test environment that is independent of EBA CLEARING poses the problem of simulating the function of the RT1 platform. With the BL Real-Time Test System, you have all the possibilities you need. The active and passive components of the system allow the representation of almost any load scenario as well as the functional mapping of realistic test cases. Without meaningful tests, neither the introduction of complex systems nor a secure handling of updates is possible. The prerequisite for the introduction of new systems are functioning test procedures. These must make reliable statements about the correctness of all systems involved. Realistic test procedures are also indispensable for checking updates if nasty surprises are to be avoided. 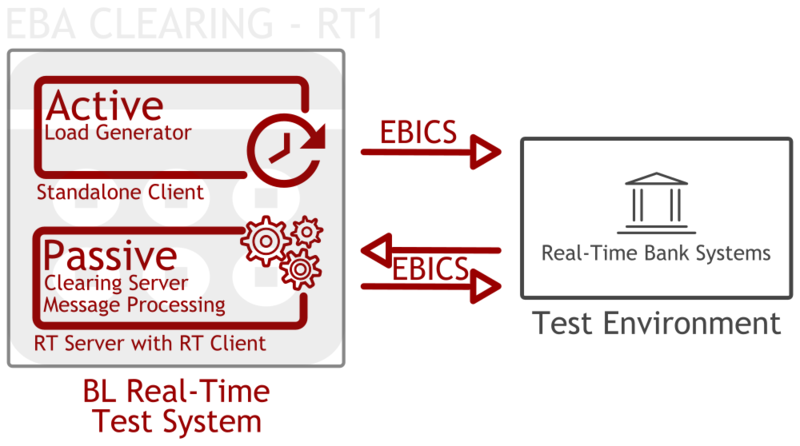 With the BL Real-Time Test System as a simulation of EBA CLEARINGs RT1 platform, complete test sequences can be reproduced including all involved banking systems. The active part of the test system is responsible for generating incoming SCT Inst payments from the clearing house. To simulate the incoming EBICs requests from the RT1 system, the active component supports two types of requests: Permanent load and individual requests. The EBICS client that comes into operation uses XML templates for generating the real-time requests. Thus, functional elements can be easily specified without having to consider purely technical aspects. The active component can simulate loads of 150 requests per second and per PC in use. Outgoing EBICS requests to the RT1 system of the EBA are represented by a high-performance Real-Time EBICS Server. The passive component, designed as a server, receives the SCT Inst messages from the bank's own real-time systems and passes them on for processing. Depending on the content of the message, various actions can be performed: sending positive or negative responses via the integrated real-time client to the real-time servers of the test environment, as well as omitting the response message (timeout). The calling test module as part of the Core Banking checks the result after receiving the answer and closes the test case. Both components for representing the clearing platform RT1 behave completely transparent to the other systems involved. 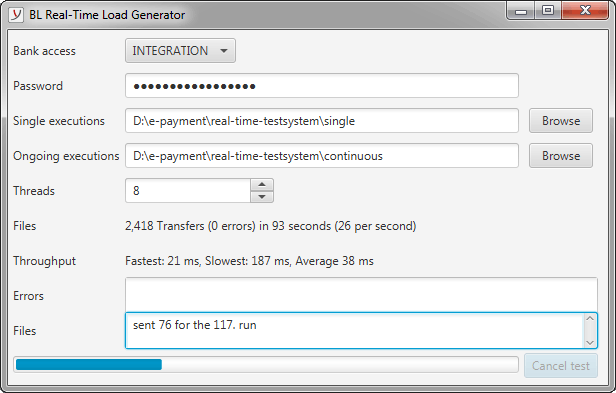 The active load generator is available both as a stand-alone program with a graphical user interface and as a command line version for the automated control of the test processes. The passive real-time server can be installed via a simple setup. The connection to the bank systems is established via standard interfaces (Message Queues, REST, etc.). Get informed now! You can reach us by phone on +49 2103 33993-30 or by email at .